Sync your SD/MMC card or Memory Stick with your PC. Did you know that HotSync backs up everything except the card? Sync Podcasts to your card - for a daily audio newspaper. Transfer family photos to your Palm. Take documents to and from work. Move MP3 files to your Sony Clie. This is the program that should come with every Palm that has a card slot. 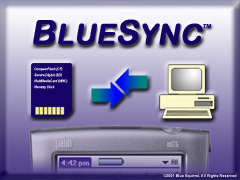 Because BlueSync will make a back up of your card on your PC when you HotSync. If this was all you ever did with BlueSync it would be worth the cost. But you can do more. BlueSync does a full synchronization with a directory on your PC, allowing you to copy files into your PC directory, HotSync, and automatically transfer the files to your Palm card. Fast - After the first HotSync, BlueSync transfers the changed or new files. Smart - Delete a file on the PC and BlueSync will remove it from your Palm, and keep an archive. Quick - One HotSync backs up a card. Convenient - After you purchase you can download and use your copy immediately. Valuable - How much is your data worth? BlueSync prevents the damages and heartaches caused by lost data.